Collecting and processing secondary materials, manufacturing recycled-content products, and then purchasing recycled products creates a circle or loop that ensures the overall success and value of recycling. 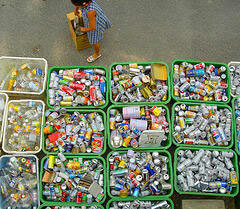 Once cleaned and separated, the recyclables are ready to undergo the second part of the recycling loop. More and more of today's products are being manufactured with total or partial recycled content. Common household items that contain recycled materials include newspapers and paper towels; aluminum, plastic, and glass soft drink containers; steel cans; and plastic laundry detergent bottles. Recycled materials also are used in innovative applications such as recovered glass in roadway asphalt (glassphalt) or recovered plastic in carpeting, park benches, and pedestrian bridges. Purchasing recycled products completes the recycling loop. By "buying recycled," governments, as well as businesses and individual consumers, each play an important role in making the recycling process a success. As consumers demand more environmentally sound products, manufacturers will continue to meet that demand by producing high-quality recycled products. Learn more about recycling terminology and to find tips on identifying recycled products.